Commercials are a type of marketing communication, of which mechanism theories have been widely studied. The studied mechanism theories mainly included two viewpoints: cognitive and affective. One of the affective effect viewpoints is the evaluative conditioning theory. According to this theory, the emotions invoked by advertisements will also present to the neutral logo of prosducts combined with advertisements, which influence the consumers’ shopping behavior. The current study explored if the evaluative conditioning can provide new insights about the effectiveness of commercials, by conducting one experiment. The experiment included two phases: a conditioning acquiring phase in which emotional videos were matched to certain neutral logos, and a testing phase which consisted of a virtual online shopping experience. Both physiological data and self-report data of arousal and valence were recorded. The emotional arousal and valence’s effect on the participants’ choice in virtual online shopping were analyzed using a binary logistic model. The valence effect was not found neither with the physiological and the self-report data. The arousal effect was found based on the self-report data. Based on the results, it is suggested that evaluative conditioning does no influence people’s shopping behavior, while the arousal level may affect people’s shopping behavior. Zhu, X. (2015, January). 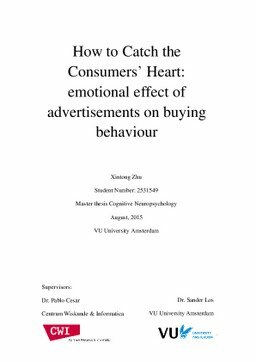 How to Catch the Consumers’ Heart: emotional effect of advertisements on buying behaviour. VU University Amsterdam.